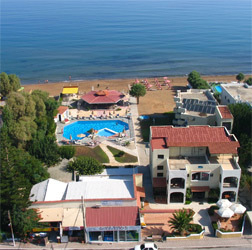 Hotel Rose is managed from a traditional greek family for 20 years offering premium services on our clients. We speak english and swedish language and your are kindly invited to our residences. Our staff is always at your service during your residence here making your stay as best as possible. We have a fully equiped super market, and a traditional greek restaurant where you can taste real cretan cuisine. Just next to the beach we have a marvelous pool bar and two pools for adults and kids.During your free time you use our free wireless internet or play billiard.